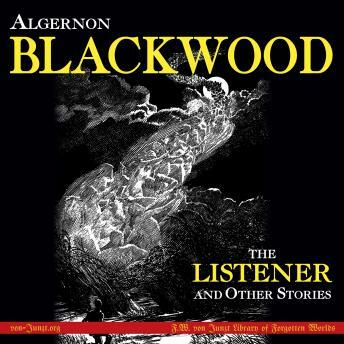 First published in 1917 by Alfred A. Knopf, this collection of Blackwood's short stories and novelettes includes some of his most loved classics, including "The Willows"; "Max Hensig, Bacteriologist and Murderer"; "The Dance of Death"; "May Day Eve"; and, of course, "The Listener." --THE LISTENER: A reclusive, impoverished writer is delighted to find an inexpensive home in an old building at the heart of London; but over three months of mounting tension, with his thoughts darkening and his dreams increasingly haunted by visions of a ghastly leonine walking corpse bending over him as he sleeps, he comes to understand why it's so cheap. --THE WILLOWS: A pair of adventurers on a canoe trip down the Danube discover, after stopping for the evening on a small island covered with tiny willow trees, that they are trespassers at the gate of unknown and hostile forces from beyond the Earth -- and they may not make it off the island alive. --THE INSANITY OF JONES: An inoffensive clerk in a fire insurance office becomes convinced, through the intervention of the ghostly presence of a deceased co-worker, that his boss was a Spanish Inquisition torturer who killed him gruesomely in a past life '" so he buys a gun and makes plans to use it. --THE DANCE OF DEATH: A young man, just diagnosed with a weak heart and very despondent about it, goes to a dance, where he meets the woman of his dreams. But is she real, or a ghost? And if she is a ghost, what is he? --THE OLD MAN OF VISIONS: The old man didn't talk much, but if one were allowed into his garret room, one could look out the window and see beyond the veils of the material world. But he was careful to warn: Never tell anyone about me, or you will never be able to find me again. --MAY DAY EVE: A skeptical, materialistic physician, on the way to visit a dreamy folklore professor, strays from the road on May Day Eve and finds himself helpless and lost in a world full of strange and wonderful spirits, which seem to be toying with him. --MISS SLUMBUBBLE'"AND CLAUSTROPHOBIA: Miss Daphne Slumbubble, a forty-something unmarried lady with bird-like mannerisms and abiding fears of men, suddenly panics at being locked in an express car and tries to leap from the train. When it stops, she learns she's not the first person this unreasoning, ghostly panic has struck in this train car. --THE WOMAN'S GHOST STORY: She was a psychic investigator on the job, trying to learn if a famous house was haunted or not. It was indeed haunted when she arrived '¦ but when she left the next morning, it was not.